The second part of this four-part series on comparing leverage trading Nadex spreads to trading other instruments, looks at the differences between the leverage trading Nadex spreads to the leverage obtained when trading futures. As stated in the first part of the series, Nadex spreads have the great combination of increased leverage with limited risk. This is significant when comparing to day trading futures. A Nadex spread is a simple derivative of an underlying market, with a built-in floor and ceiling level that defines the lowest and highest points that it can settle. The floor and the ceiling establish the points where the risk stops. Whether buying or selling the spread, traders cant lose additional funds if the price moves against them past the ceiling or floor. 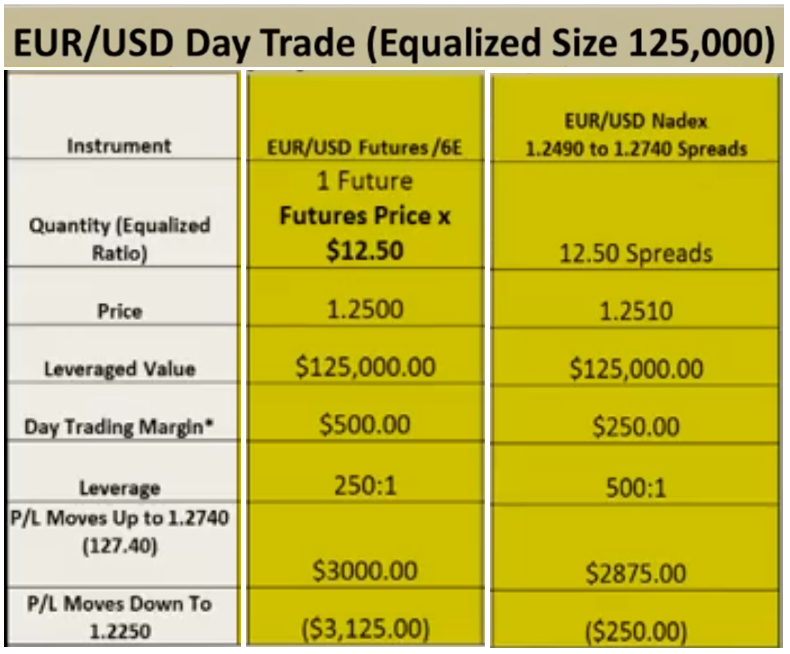 Compare an equalized EUR/USD day trade size of 125,000, which is a position day trading one contract of the EUR/USD futures/6E, to a position day trading 12.5 Nadex Spreads. Traders cant trade half of a spread, but for comparison purposes, the numbers will use 12.5 spreads for equal sizes. First, to place the trade for the futures, a trader needs a margin of $500. The leverage in turn will be 250:1, which is pretty good, and that comes to a leveraged value of $125,000, or one futures contract. However, the far right column shows that Nadex spreads get double the leverage. At 500:1, a trader only has to put up half the money of the future trade, or $250 to leverage the same value of $125,000. What about risk? Again, Nadex spreads have the advantage. In the "P/L moves down row," showing example losses, Nadex spreads lost only $250, while the futures lost into the thousands, at a much higher $3125. Profit is comparable though. Had the trade been a winner and price moved up, Nadex would have profited with $2,875, similar to the futures trade possible profit of $3,000. Another very significant point is when day trading futures, traders have uncapped risk. Futures margins have unlimited risk, down to zero when long, and infinite risk when short and the market continues going up. Nadex spreads, in contrast, have capped risk. With Nadex spreads, traders only need $100 to start, and only need to cover the max potential risk when opening a position. There is no minimum account balance needed to maintain, either. Because the risk is capped and defined up front, the leverage is high and the upfront collateral to trade is low, Nadex spreads are great for hedging futures day trading positions. To continue to learn more about Nadex spreads and how to trade them, you can visit www.apexinvesting.com. APEX provides education, tools for trading, including the spread scanner, and chat rooms for support. In the APEX chat rooms, experienced and up-and-coming traders help each other gain an edge and be successful in trading. On the website, you can sign up for a free trial and experience the training webinars, and other trading tools. If you go to www.nadex.com, you can sign up for a demo account and learn more about Nadex spreads.